What Happens If You Never Change Your Car’s Oil? A dealer friend of ours recently recounted a terrifying tale in which the protagonist failed to change his oil over the course of 8 years. We’ll spare you the gory details, but know this: the story didn’t end well for the owner of that poor car. So, let us ask you: When’s the last time you changed your engine oil? If it was when St Louis still had a pro football team, we’re here to push you into the service center, like, yesterday. You don’t even want to know what happens to an engine when its oil and filters aren’t changed (but we’ll tell you anyway). 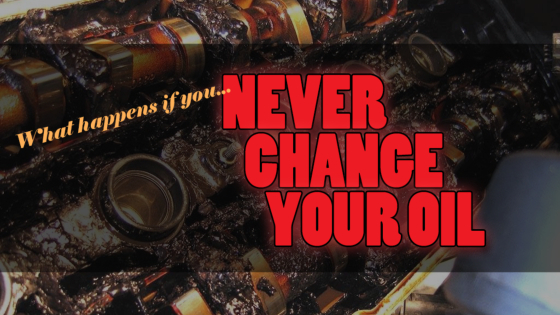 First, you need to know when to change your oil because “never” is not an acceptable length of time. Although the traditional rule is to change your oil every 3,000 miles or 3 months, modern vehicles are typically a bit more lenient, requiring you to get an oil change after 5,000-plus miles. While that extended maintenance time is nice, it can also cause unintended consequences—namely forgetfulness camouflaged as peace of mind, leading to a missed oil change here and a skipped oil filter replacement there. Oil changes: Are they really better at an express shop? Let me ask you this … are you more apt to go to the dealership or an auto repair chain when you need service? How about for an oil change? I think it’s important to share some common myths about dealerships and oil change centers. Myth #1 : Oil changes are cheaper at an oil change center than at the dealership. After gathering from the six McCarthy dealerships, an average oil change is around $31. And, after speaking to a gentlemen at the nearest chain shop, the cost was $36.99 plus tax (and an additional $4.99 if it exceeds 5 quarts). Interesting! Myth #2: It’s quicker to get your oil changed at an oil change center. Afterall, they are called “quick” oil change shops. At our dealerships, on average, 45 minutes is the allotted time for an oil change. And after calling a different, chain shop in Overland Park, KS a wait of 1 and a half hours was given to me. Another reason, and probably the most important one, is the quality of work at the dealer. Dealership service professionals are master technicians and have certification levels, years of training and education, checklists provided by manufacturers … the list goes on. And a customer who takes their vehicle to the dealer each time will not only earn good will, but a better resale value on the vehicle when they trade it back in (all records documented). So, utilize the dealer! Do you take your vehicle to a dealership to get your oil changed? Why or why not? Time for an oil change … what do you do? Wow! I’m a little shocked. Out of 46 voters, 70% chose number 1 and 2. Looks like we have some very responsible people out there. I applaud you. For the remainder, thanks for the honesty. It looks like 11% take it in when they come around to it and an equal 11% make their husbands take it in. And, luckily, there were zero votes for number 5; avoid it all together. Words of advice: Get your oil changed on time. An oil change helps lubricate the internal parts of your vehicle. The fresher the oil, the smoother it runs. And if you maintain it at regular oil changes, you will avoid locking up your motor and ruining your engine (worst case scenerio). For the 22% of you who wait or nominate a partner to get an oil change, why do you?